I found a page full of computations sitting around the house this evening. Naturally, I picked it up and gave it a look. 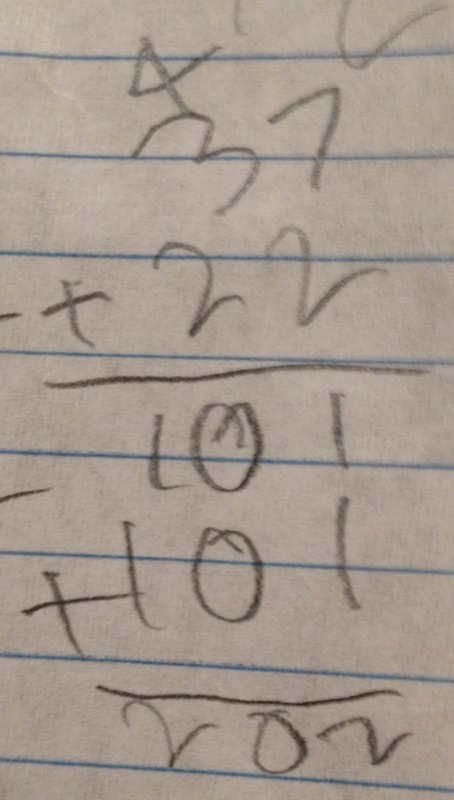 Griffin (10 years old, 5th grade) had been doing some multiplication in class today. Somehow his scratch paper ended up on our couch. Here is one thing I saw. Naturally I wanted to ask the boy about it. He consented. Me: I see you were multiplying 37 by 22 here. Griffin (10 years old): Yeah. But I got it wrong so I did it again with the lattice. Me: How did you know you got it wrong? G: I put it in the answer box and it was wrong. It turns out they were doing some online exercises. There is an electronic scratchpad, which he found awkward to use with a mouse (duh), plus his teacher wanted to be able to see their work, so was encouraging paper and pencil work anyway. I was really hoping he would say that 37 times 22 has to be a lot bigger than 202. Alas he did not. Anyway, back to the conversation. Me: OK. Now 37 times 2 isn’t 101. But let’s imagine that’s right for now. We’ll come back to that. G: Wait. That’s supposed to be 37 times 2? I though you just multiplied that by that, and that by that. He indicated 7 times 2, and then 3 times the same 2 as he spoke. Me: Yes. But when you do that, you’ll get the same thing as 37 times 2. A brief moment of silence hung between us. Me: What is 37 times 2? Let us pause to reflect here. This boy can think about numbers. He got 37 times 2 faster in his head than I would have with pencil and paper. But when he uses the standard algorithm that all goes out the window in favor of the steps. The steps trump thinking. The steps trump number sense. The steps triumph over all. Me: Yes. 74. Good. I like that you thought that out. Let’s go back to imagining that 101 is right for a moment. Then the next thing you did was multiply 37 by this 2, right? I gestured to the 2 in the tens place. Me: But that’s not really a 2. Me: That’s a 20. Two tens. Me: So it would be 101 tens. I know this reads like I was dragging him through the line of reasoning, but I assure you that this is ground he knows well. I leading him along a well known path that he didn’t realize he was on, not dragging him trailing behind me through new territory. We had other things to discuss. Bedtime was approaching. We needed to move on. Me: Now. We both know that 37 times 2 isn’t 101. Let’s look at how that goes. You multiplied 7 by 2, right? Me: So you write the 4 and carry the 1. G: That’s what I did. Me: and carried the 4. Yeah. If you had done it the other way around, you’d have the 4 there [indicating the units place], and then 3 times 2 plus 1. Me: Yeah. So there’s your 74. This place value error was consistent in his work on this page. Let me be clear: this error will be easy to fix. I have no fears that my boy will be unable to multiply in his adolescence or adult life. Indeed, once he knew that he had wrong answers (because the computer told him so), he went back to his favorite algorithm—the lattice—and got correct answers. I am not worried about this boy. He is and he will be fine. But I want to point out…I need to point out that this is exactly the outcome you should expect when you go about teaching standard algorithms. If you wonder why your kids (whether your offspring, your students, or both) are not thinking about the math they are doing, it is because the algorithms we (you) teach them are designed so that people do not have to think. That is why they are efficient. If you want kids who get right answers without thinking, then go ahead and keep focusing on those steps. Griffin gets right answer with the lattice algorithm, and I have every confidence that I can train him to get right answers with the standard algorithm too. But we should not kid ourselves that we are teaching mathematical thinking along the way. Griffin turned off part of his brain (the part that gets 37 times 2 quickly) in order to follow a set of steps that didn’t make sense to him. And we shouldn’t kid ourselves that this is only an issue in the elementary grades when kids are learning arithmetic. Calculus. So many formulas (algorithms) that force students not to think about the underlying relationships. If we wanted students to really think about rates of change (which are what Calculus is really about), we might have them develop a theory of secant lines and finite differences before we do limits and tangent lines. We might have Calculus students do tasks such as Sweet Tooth from Mathalicious (free throughout October!). There, students think about marginal enjoyment and total enjoyment. This is pervasive in mathematics teaching. The results are mistaken for the content. So we teach kids to get results. And we inadvertently teach them not to use what they know about the content—not to look for new things to know. Not to question or wonder or connect. I’m telling you, though, that it doesn’t have to be this way. Consider the case of Talking Math with Your Kids. There we have reports from around the country of parents and children talking about the ideas of mathematics, not the procedures. Consider the case of Kristin (@MathMinds on Twitter), a fifth grade teacher, and her student “Billy”. Billy made an unusual claim about even and odd numbers. She followed up, she shared, we discussed on Twitter. Pretty soon, teachers around the country were engaged in thinking about whether Billy would call 3.0 even or odd. But standard algorithms don’t teach any of that. They teach children to get answers. They teach children not to think. I have read about it. I have thought about it. And tonight I saw it in my very own home. 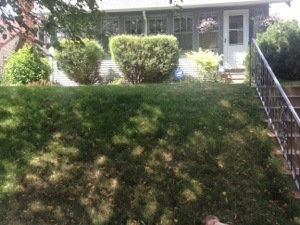 Our house in St Paul sits on top of an odd hill; higher than others around it. Historical reasons for this are murky but it makes the place easy for guests to find. One of my least favorite tasks in all of my domestic life is mowing the hill. For a while now, the precise height of this hill has been the subject of family speculation. One recent lazy summer afternoon, Griffin (8 years old), Tabitha (6 years old) and I found ourselves hanging out on the hill with not much to do. Me: How tall do you two think the hill is? Tabitha (6 years old): Five feet. Griffin (8 years old): I don’t know. Me: How about this: Which do you think is taller; me or the hill? Me: Wait. I’m six feet tall. How can the hill be 5 feet tall AND taller than me? G: You’re six feet, one inch. T: Oh. I don’t know how tall the hill is, but I think it’s taller than you. Me: Yeah, but just because it’s longer than me doesn’t mean it’s taller than me. Tabitha seems puzzled by this distinction. Griffin is standing on the sidewalk at my feet. Me: Look at Griffy’s eyes. Is he looking up or down at my eyes right now? T: I can’t really tell. I stand up, right next to Griffy, who cranes his neck back to look me in the eye. 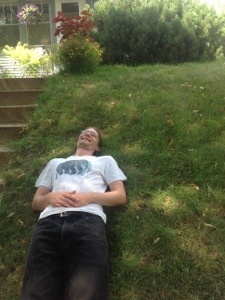 I lie back down on the hill. Me: So how come there’s a difference? T: You’re lying down now, so that’s not really how tall you are. Me: So how can we decide whether I am taller, or the hill is? Nothing much occurs for the next minute or so. We are distracted by butterflies, the edible nature of clover flowers and other wonders of Minnesota’s too-short summers. Me: Hey! Let’s try this. Tabitha, you go to the top of the hill. She does, and she stands there, looking down on me with a self-satisfied smile on her face. Me: OK. So you plus the hill are taller than I am. What about just the hill? She does, although it takes a few tries to achieve the desired position by which she can look at me from roughly the level of the top of the hill. Me: Are you looking up or down at me? Griffin takes his turn at the top of the hill. He, too, is unsure. Me: So how can we be sure? T: You know, Daddy, I don’t really need to know this. Me: You’re right. You don’t. Nor do I, really. But I have always been curious how tall the hill is. Aren’t you? G: We could measure a step, then use the number of steps to figure out how tall it is. I obtain a tape measure. We determine that each step is 7 inches tall. We notice that the bottom step is shorter than the rest and measure it at 5 inches. Griffin laboriously counts the steps, finding that there are eight of them, plus the smaller one. G: So what is that altogether? Me: What? You can do this. G: Do you know whether you are taller than the hill? Me: Actually, yes I do, even though I don’t know exactly how tall the hill is. G: If I figure it out, will tell me whether I’m right? G: [Far too quickly for me to be convinced he has run any computations at all] OK. The hill is taller. Me: How do you know? G: Hey! You said you would tell me! Me: That’s part of doing the math! A long, thoughtful pause ensues. G: Eight eights is 64, plus 5 is 69. So you are taller. Me: But you need eight sevens, which is 56. G: Oh. Right. Plus 5. Me: Seriously? You can do 56 plus 5. Me: Yes, and I’m 73 inches tall. Tabitha, despite her protestations about not needing to know, has been paying attention all along. T: You’re taller than the hill? Me: Yes. See? I told you it was interesting. G: You knew you were taller? Me: Yes. But I didn’t realize it was by a foot. I thought it would be only by a few inches. G: How did you know? Me: Because I look down—only slightly—but I look down at the top of the hill. In a few days, we will return to the topic of the State Fair Giant Slide and see whether these techniques generalize in my children’s minds. 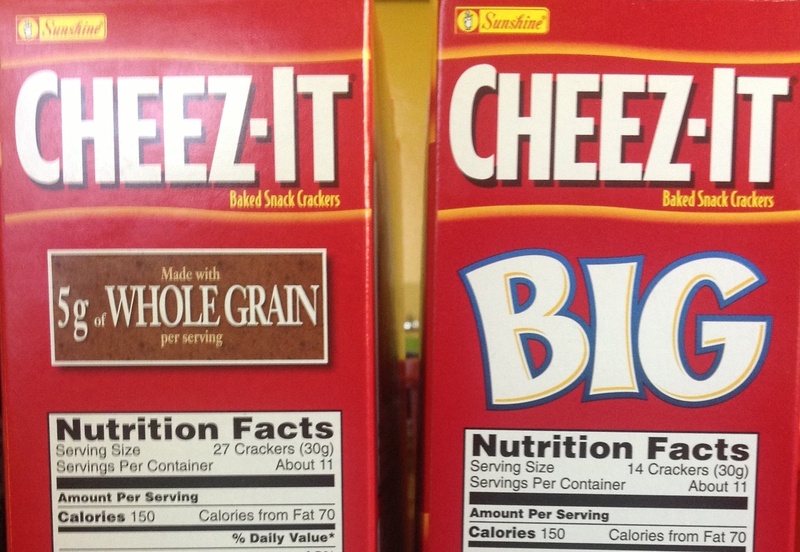 There are now BIG Cheez-Its (U.S. only, it appears). The package claims that they are “Twice the size!” of regular Cheez-Its. On seeing this claim, I thought for sure that we were gonna have a We mean four times, but say twice sort of a situation on our hands. So I bought some. And then I asked Tabitha (6 years old) and Griffin (8 years old) what they thought. I started with Tabitha when Griffin wasn’t around so I could get her pure thoughts. She put one cracker on top of the other and proclaimed, “No”. I wanted to know the source of that. I thought she might be making the classic linear v. area error (i.e. interpreting twice to mean twice the side length). So I asked. She pointed to the uncovered part of the BIG Cheez-It and argued that this didn’t constitute another full regular Cheez-It. Score one point for argumentation, but minus one for spatial visualization. A few minutes later, it was Griffin’s turn. He ran like a chipmunk with his two crackers into the dining room. Experiment over, right? He was in search of paper and a pen. He carefully traced each cracker, cut out the uncovered part of the BIG one and attempted to partition and reassemble this remainder on top of a tracing of the regular cracker, which it did not completely cover. Sadly the cut outs are lost forever. His conclusion: BIG Cheez-Its are almost but not quite twice the size of the regular Cheez-Its. 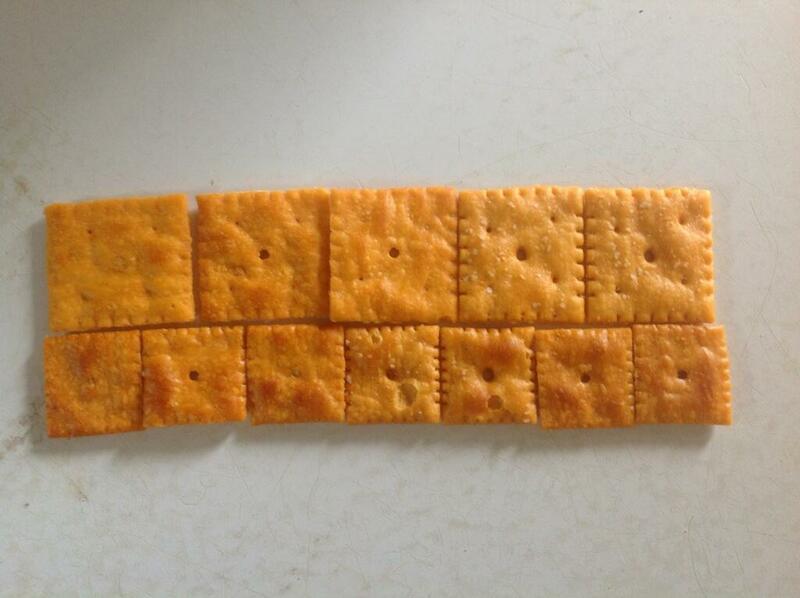 If the crackers are twice as big, but the mass of one serving is constant, and if one serving of regular Cheez-Its consists of 27 crackers, how many crackers should be in one serving of BIG Cheez-Its? 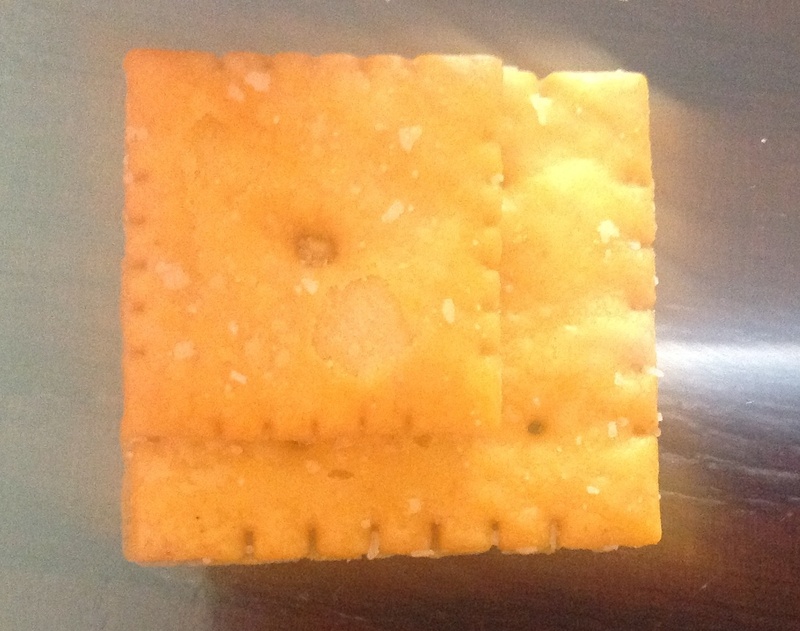 If the area of a BIG Cheez-It is about twice the area of a regular Cheez-It (as Griffin confirmed), then the side lengths should be in a ratio of approx. 7:5 (a reasonable estimate of the square root of 2). Notice the progression in the children’s strategies. The six-year old worked with the crackers. The eight-year old worked with representations of the crackers. Similar conclusions were reached; the child who worked with representations could manipulate those representations in order to achieve a greater degree of accuracy, and to investigate hypotheses that the child working concretely could not. 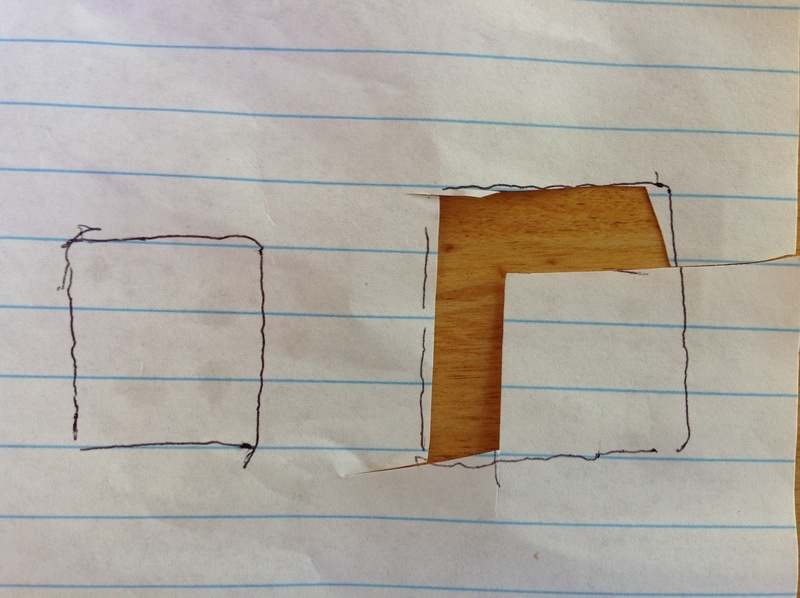 Neither child used tools to calculate areas. The Minnesota State Fair is a fabulous event (Twelve days of fun ending Labor Day!). Rachel and I love the Fair, and we have passed this love along to our children. 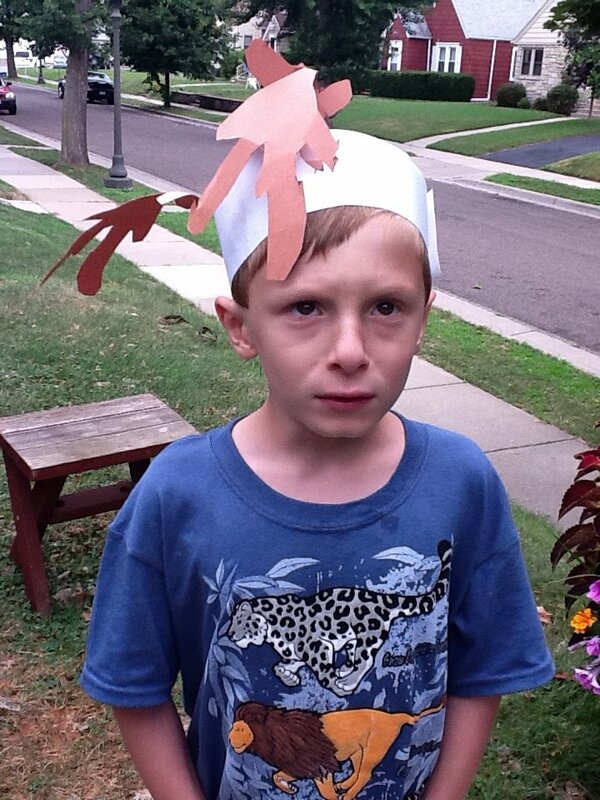 Griffin must have been thinking about the wonders of the State Fair as summer slowly (oh, so slowly!) unfolded on our fair state. He asked a question at breakfast one recent morning. Griffin (eight years old): How tall is the Giant Slide? Me: Good question. I would guess…40 feet. What’s your guess? OK. That’s a mistake. We should have written our guesses down privately to avoid influencing each other. Oh well. Me: Let’s look it up. Google returns nothing useful. It does return this awesome video, though, which we watch together. Me: I found lots of information mentioning the Giant Slide, but nothing on its height. G: Measure it yourself, then! Me: Good idea. How should we do that? G: We’re gonna need a lot of tape measures put together. This will be a summer project for us: Measuring stuff without putting a ruler next to it. I’ll report on our progress in this space. I found some notes on a conversation I had with Griffin last fall. I do not remember the context for it. Me: Do you know what 12÷2 is? Me: How do you know that’s right? G: 2 times 6 is 12. Me: How do you know that? G: There were 26 kids in Ms. Starr’s class [in first grade], so it was her magic number. We had 13 pairs of kids. Here we see the role of cognitive load on mental computation. Griffin is splitting up 34 as 30 and 4 and finding pairs to add to each. Formally, he’s using the distributive property: . He wants to choose and so that . But by the time he figures out that , he loses track of the fact that and just adds 4 to 15. At least, I consider this to be the most likely explanation of his words. My notes on the conversation only have (back and forth), which indicates that there was some follow-up discussion in which we located and fixed the error. The details are lost to history. Me: So 12÷2 is 6 because 2×6 is 12. What is 12÷1? G: [long pause; much longer than for any of the first three tasks] 12. Me: How do you know this? G: Because if you gave 1 person 12 things, they would have all 12. Let’s pause for a moment. have multiple interpretations which people encounter as they live their lives. It is (or should be) a major goal of mathematics instruction to help people reconcile these multiple interpretations. Griffin has so far relied upon three interpretations of division: (1) A division statement is equivalent to a multiplication statement (the fact family interpretation, which is closely related to thinking of division as the inverse of multiplication), (2) Division tells how many groups of a particular size we can make (Ms. Starr’s class has 13 pairs of students—this is the quotative interpretation of division) and (3) Division tells us how many will be in each of a particular number of same-sized groups (Put 12 things into 1 group, and each group has 12 things). This wasn’t a lesson on multiplication, so I wasn’t too worried about getting Griffin to reconcile these interpretations. Instead, I was curious which (if any) would survive being pushed further. G: [pause, but not as long as for 12÷1] Two. G: Half of 12 is 6, and 12÷6 is 2, so it’s 2. Me: OK. You know what a half dollar is, right? Me: How many half dollars are in a dollar? Me: How many half dollars are in 12 dollars? G: [long thoughtful pause] Twenty-four. Me: One more. How many quarters are in 12 dollars? G: Oh no! [pause] Forty-eight. Because a quarter is half of a half and so there are twice as many of them as half dollars. 2 times 24=48. It is perhaps not widely known that I love good Mexican food, and that—with the assistance from afar of Rick Bayless—have developed a number of specialties de casa. 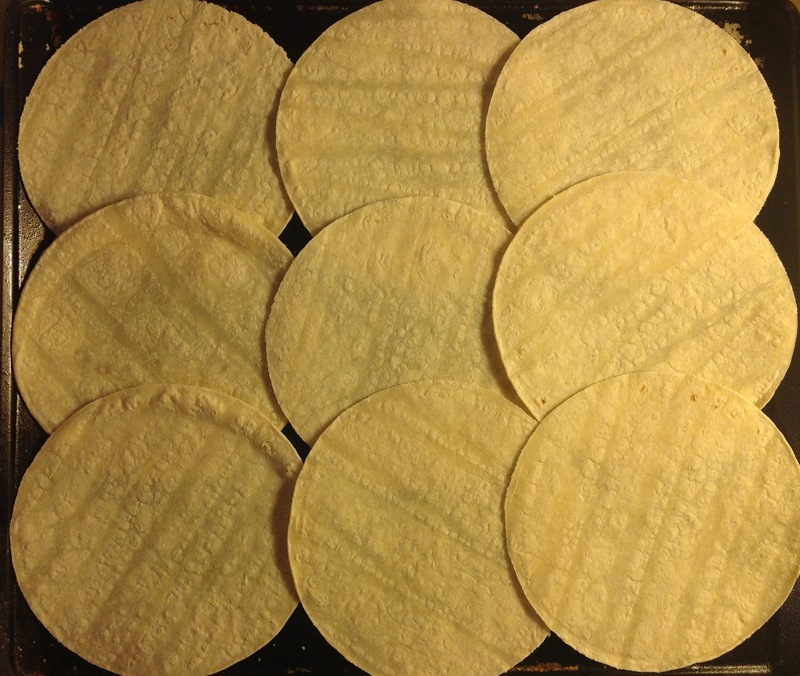 Among these specialties is tostadas, which I make starting with corn tortillas. A bit of oil and 10—15 minutes in the oven makes them crispy. We build from there. The tortillas fit nicely in a 3 by 3 array on my favorite cookie sheet. There are four of us in the family. You can see where this is going, I am sure. Griffin served himself a second tostada the other night. Tabitha (six years old): Griffy’s having another one?!? Me: Yes. There’s a second one for you, too. T: How many did you make? T: That’s not a fair number! Me: What would be a fair number? T: One where everybody can have the same amount. Me: Right. But how do you know 9 isn’t a fair number? And what would be one? Griffin (eight years old): Eight would be. Or 40. Me: Oh! Forty! Then we could each have 10. Would you like to eat 10 tostadas, Tabitha? But then I would need to buy a second pack of tortillas. G: Or 20. Or 12. The final count is 2 tostadas each for Mommy and Tabitha, and tostadas each for Daddy and Griffin. Along the way, I promise Tabitha a taco if she finishes her second tostada and is still hungry. This strikes her as fair. This one is from the deep, deep archives. 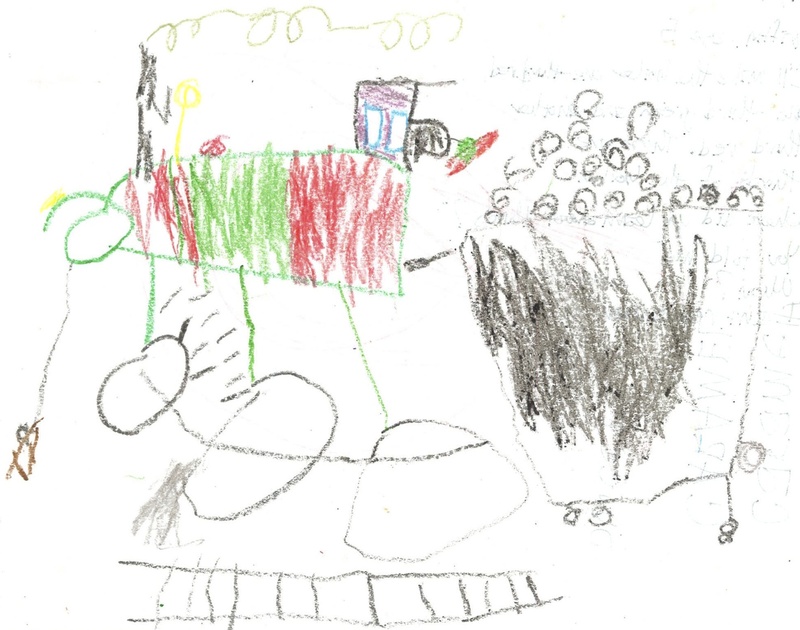 When Griffin was five years old, he drew the picture below. Griffin (five years old): I’ll make the boiler one-third red, one-third green and another third red. Me: Where did you learn about thirds? Griffin seems to have absorbed a part-whole model for thirds that roughly matches how young children often think of halves. Compare to his performance two years later. In that later conversation, Griffin was struggling to think about one-fourth of two. This pretty much matches a major argument in the book Extending Children’s Mathematics by a subset of the CGI research team. Their claim is that a part-whole fraction model is not very useful as the beginning place for thinking about fractions; that instead the extension of sharing division to complete and equal sharing involving remainders is a more natural place for beginning fraction instruction. See also Tootsie Rolls.